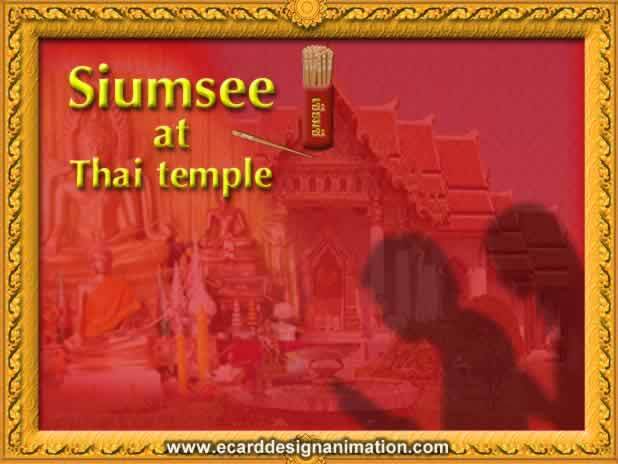 Foretell Siumsee sets include a section of thick bamboo. Inside the can are flat wood sticks. And there is a number on each stick. So, we will ask any question we have in our mind, then shake the can until one of the wood sticks come out of the can. (Just one! If more than one pop out, we have to put them back in the can and shake it again.) Now, we look at the number on the stick, remember that number, and ask for the fortune teller paper at the temple counter.Usually we also use two woods, which are shaped like a quarter moon but in red color, to tell us whether the number we get is the answer to our question or not. If it's not, we have to start all over again.